Snowstorms often add up to long hours and sleepless nights for plow truck drivers. Stopping for meals may not be an option so they grab fast food and an energy drink and keep going. Dr. Amy Jamieson-Petonic, program manager for the Cleveland Clinic Wellness Enterprise, says that the nature of the job is inherently risky but those who don’t take care of their health and wellness can compound the problem. “A lack of activity and a lack of sleep can increase your risk of chronic disease such as heart disease, diabetes and cancer,” she says, noting that research has shown an increased risk of diabetes with even one night of sleep deprivation. Why add poor nutrition to the mix? “Fast food tends to offer high-fat, high-sugar choices, which negatively impact the body,” she says, adding that reliance on energy drinks to stay awake is also a concern. The US Food and Drug Administration reported in January that hospitalizations due to energy drink consumption have doubled since 2007, with 20,000 reported incidents in 2011. “I know they are a quick fix, but we’ve seen people experiencing cardiac issues, irritability and even deaths linked to these drinks. We don’t know everything they’re putting into these beverages, and what we don’t know could hurt us,” she says. Understanding that stopping, stretching and grabbing a more nutritious meal isn’t always possible in the midst of a storm, Dr. Jamieson-Petonic says it is still possible to make better choices. All it takes is advance preparation. Nuts: Appropriate portion sizes of unsalted almonds, cashews, walnuts and peanuts all offer heart-healthy fats that provide good energy, fiber and protein. 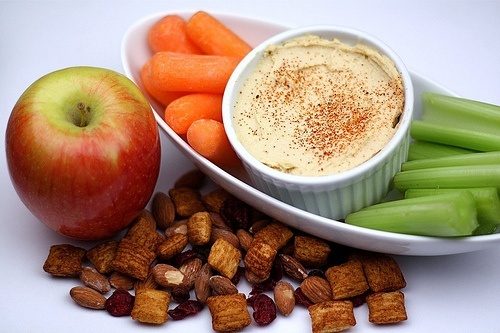 Trans fat-free peanut butter: Eat with celery or whole grain crackers and pretzels. Some brands offer single-serve cups that make it more portable. Like nuts, peanut butter offers the healthy fat that can get you through the long hours. Trail mix: Whether homemade or store-bought, trail mix can provide a long-lasting energy boost. Steer clear of those containing high-sugar items. Fresh veggies: Baby carrots, celery and peppers are easy snacks and provide vitamins and nutrients. Protein bars: Choose those that are low in sugar and feature all-natural ingredients. “Some of these bars you need a biochemistry degree to pronounce the ingredients,” she says. Cheese/yogurt: If you can pack perishables, string cheese is a great option, as is low-fat yogurt. Avoid fruit-on-the-bottom yogurts, which often are high in sugar. Dehydration is also a concern. While green tea, 100% fruit juice and smoothies all can be beneficial, water is your best defense against dehydration. Need a warm drink? If it’s coffee—make it black, she says. A better option may be to stir instant breakfast mix into hot cocoa for added vitamins and minerals. Cheryl Higley is Editor of Snow Business Magazine. GoPlow.com is powered by Snow Business magazine and the Snow & Ice Management Association.